Lulu is a young husky who stays with us at least once a year while her humans travel. Her stunning appearance gets her a lot of compliments while we are out walking. People love the idea of getting a husky because they are pretty. Many first time dog owners don't realize they are also a lot of work. 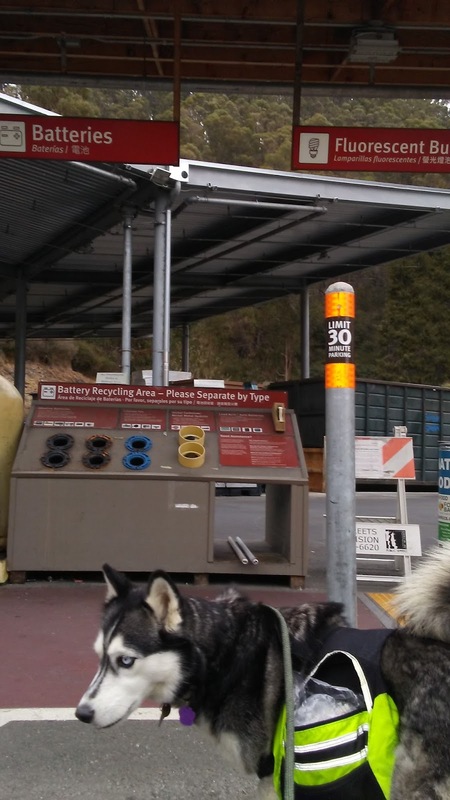 Huskies are high energy working dogs. As pets, they get bored easily. I was mentally prepared to take her out for two walks everyday and each walk would be at least 30 minutes. If she doesn't get her exercise, she could potentially start tearing things apart or digging big holes in the yard. In other words, she'd need to let out her energy in other ways. Lulu likes to wake me up in the early morning between 4 to 7 a.m. 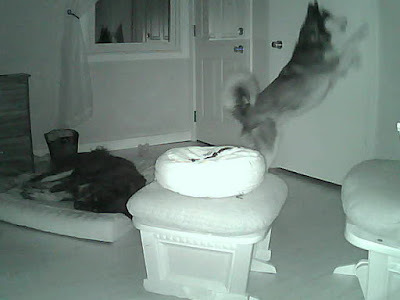 I took some photos (with Wifi cam) of her pounding on my bedroom door in the morning. It's not exactly how I like to wake up in the morning. 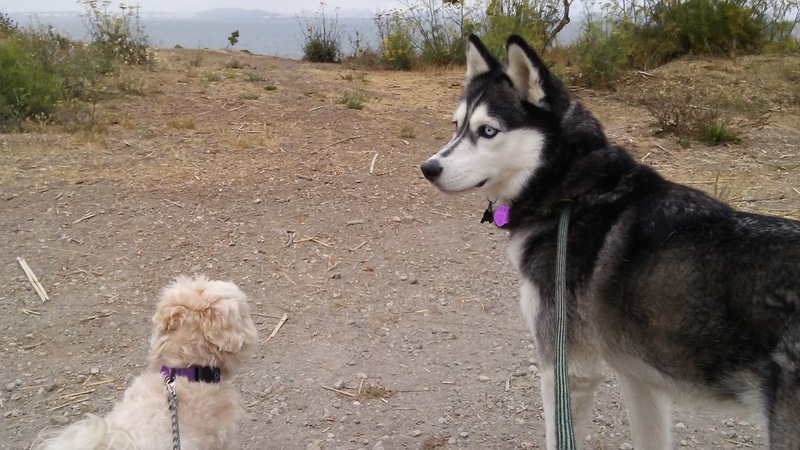 Since she does not like Point Isabel, I have been taken her to other trails such as Albany Bulb, Motorcycle Hill Trail, Memorial Grove, etc. The other day I remembered that I have doggy backpacks that I got for Kelsey years ago. I put them on Lulu we took a fast walk to El Cerrito Recycling Center to drop off some dead batteries and light bulbs. With the packs on her, she started walking in a straight line instead of trying to pull in different directions. We felt that we accomplished something after dropping off those items. When we hiked up Motorcycle Hill Trail, she also carried all of our drinking water. Both Lulu and Cracus were super thirsty as we reached the top of the hill and couldn't wait to drink up the water. 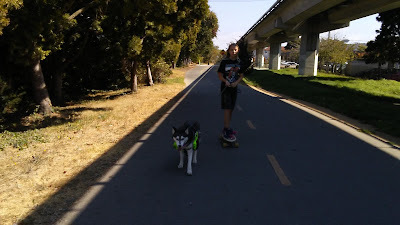 My little helper, Katy, also tried some urban sledding with Luly using her skateboard. Lulu wasn't quite sure what we wanted her to do, so I had to run with Cracus in front of them for her to chase after us. Once she started running, it was too fast and scary for Katy, so I had to stop running. We need to teach her some commands for pulling the skateboard. I am a firm believer that a dog is happiest when he/she has a job to do whether is doing some funny tricks or carrying a few things.